This text was originally notes for a talk on the Paris Commune of 1871 so it may be a bit unclear in parts. The Commune was the first revolution where the working class played a central role and sought to change society for the better. In 1871 France went to war with Prussia and was defeated. The head of the national government was Adolphe Thiers, he had negotiated the details of the peace with Prussia. After doing this he was faced with the problem of regaining control of Paris, of convincing the city that the war with Prussia was over and of disarming the National Guard. Thiers has only twelve thousand troops left after the truce to do this with against several hundred thousand national guards. He had no time. The rural majority in the Assembly was moving from Bordeaux where it had held its first meetings to be clear of the Prussians, to Versailles, close to Paris. The Prussians were still occupying Northern France, as security for the payment of the war indemnity which France had agreed to pay as a condition of peace. In order to be able to pay the first instalments on this indemnity and so to secure the evacuation of northern France by the Prussian troops , the French government would need to raise loans. Money could only be raised however is the public had confidence in the new government. Thiers’s principal problem was, therefore , the restoration of confidence. Order would have to be re-established, shops opened up, business resumed and life returned to normal. Above all, since Paris was the heart of the nation, Paris would have to be brought under the control of the National government. Paris however was defiant. It would not accept a Prussian victory. This meant it was not pleased with the government that had capitulated to the Prussians. Patriotic resentment of the French defeat inevitably meant resentment of the new government at Versailles. The Paris National Guard remained on alert, ready to resist any forcible entry on the Prussians into Paris. Cannons left over from he siege of Paris were taken to various parts of Paris. In the end it was those cannons taken to working class districts that became the critical issue. As Thiers said afterwards businessmen were going around repeating constantly that financial operations would never be started up again until all those wretched were finished off and their cannons taken away. It was the governments attempt to capture the National Guard’s guns early on the morning of Saturday, that sparked of the revolution. The plan was to occupy strategic points throughout the city, capture the guns and arrest known revolutionaries. Thiers himself and some of his ministers went to Paris to supervise the operation. At first, Paris being asleep all went well. But soon crowds began to collect jeering at the soldiers. The National guard began to turn out, not in support of the government but not really knowing what to do. The regular troops still waiting for transport to arrive to cart the guns away began to find themselves out numbered. Events first took a serious turn at Montmartre when the troops refused to fire on the crowd and instead arrested their own commander, who was later shot. Elsewhere in the city officers found they could no longer rely on their men, and in the early afternoon Thiers decided to abandon the capital. Jumping into a waiting coach he scribbled an order for the complete evacuation of the army to Versailles and summoned the rest of his ministers to follow him. The retreat of the army to Versailles was chaotic. The troops were insubordinate to their officers and it was only the gendarmes who could keep some kind of order. So hasty was the withdrawal that several regiments were forgotten and left stranded on Paris (20 thousand). The officers were taken prisoners, while some 1,500 men left behind with no orders just sat out the period of the commune. The government has abandoned the city. By 11.00 that night the Central committee of the National Guard finally mustered up enough members and enough courage to take-over the abandoned Hotel de Ville, while other National Guard commanders and men occupied the remain in public buildings in the capital. It was the Blanquests who had finally taken the initiative when Brunell led the hesitant Bellevois (head of National Guard committee) into the deserted Hotel de Ville. When the central committee at last arrived in the Hotel de Ville there was great confusion , national guards and soldiers were wandering everywhere and no one had the authority to lead. This revolution was a spontaneous uprising throughout the capital, there having being no central direction by any of the various National Guard committees. The Duval, Eudes, Brunel and all the Montmartre committee were for marching on Versaille, however the Blanquests were not listened to. The insurgents found Paris open for the taking, but the main concern of the National Guard Central committee was to legalise it’s situation by divesting itself of the power that had so unexpectedly fallen into its hands. Instead therefore of following up the rout of the army by marching on Versailles as the Blanquists had urged the Committee entered into the negotiations with the only constitutional body left in the city the Mayors to arrange the holding of the elections. As one communard asked on voting day What does legality mean at a time of revolution This search for a return to legality brings out the moderation of the revolutionaries so far. Many of the members of the Central Committee felt that events had outstripped them. As one of them said that evening we did not know what to do ; we did not want possession of the Hotel de ville we wanted to build barricades. We were very embarrassed by our authority . It was left to the bohemian literary figure of Edourard Moreau, to persuade the central committee amidst shouts of ’Long live the commune’ to remain in occupation of the Hotel de Ville at least for a few days until municipal elections could be held. 8 days later Paris wide elections were held with 227,000 votes being cast. This was only half the total on the electoral registers but these dated back to before the war, since when there had been a big reduction in the population. This exodus worked to the advantage of the more working class areas as it was mainly the more wealthier sections that had left. So also did the proportional system of representation adopted by the Central committee which gave more representation to the densely populated working-class districts than the previous system. The results showed an overwhelming swing to the left, only about 15 to 20 moderate republican being elected and they soon resigned. The most solidly working class districts were the most strongly pro-communard. The list of the Vigilance committees which had attracted only a small proportion of voters in the national election a month ago now found itself in the majority. This was not because of a sudden rush of converts to the ’revolutionary socialist position’, but because the republican majority in Paris was now willing to vote for the commune as a defensive vote against Thiers and the monarchist National Assembly at Versailles. In the working class districts the victory had a more precise meaning, something, it was now hoped would now be seriously done to favour those previously excluded from government. The commune was formally installed in the Hotel de Ville two days later in the glorious spring sunshine of Tuesday, 28 March. The national Guard battalions assembled, the names of the newly elected members were read out , as, wearing red, they lined up on the steps of the Hotel de Ville under a canopy surmounted by a bust to the republic. On high the red flag was flying as it had done ever since 18 March and guns saluted the proclamation of the Paris Commune. 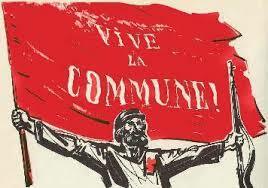 The commune finally numbered 81 members, the average age was 38, five members being over 60. Raoul Rigault, the communes head of police was at 25 the youngest of 15 in their twenties, eighteen more having just turned 30. The members of the Commune lacked political experience. Their debates were often rambling, matters being dropped rather that pushed to a decision and entirely unrelated points were raised and then persued. Their caused considerable personal acrimony and eventually this lead to a split. The commune as a whole lacked political direction. This was especially serious because it had to win a civil war in order to survive at all. It was on questions such as education or the reform of working conditions that because of the trade union experience of some of its members the commune showed to its best effect. Blanqui, as an experienced revolutionary might just have provided some political cohesion but he had been picked up by police and spent the second revolution of his lifetime in prison. Charles Delescluze was the most notable political figure from the past to sit on the commune. He had been a radical Jacobean figure in the 1848 revolution until forced into exile and was imprisoned when he tried to return secretly. However years on Devil’s Island had ruined his health. He could only speak in a croaking voice and stayed above the personal struggles and quarrels of the commune until called upon to play a dignified but doomed role at the end, walking deliberately to his death on a barricade at what is today is the Place de la Republic. 18 members of the commune came from middle class backgrounds from which they had extricated themselves during their school and student days. In all some 30 members of the commune can be classed as from the provinces, half of them being journalists on republican papers. The rest included 3 doctors, only 3 lawyers, three teachers, one vet, one architect and 11 who had been in commerce or working as clerks. About 35 members were manual workers or had been before becoming involved in revolutionary politics. These were mainly craftsmen in the small workshops that made up the long established trade centres of the capital. Typical of his group were copper bronze and other metal workers, carpenters, masons house decorators and bookbinders. What is striking is how few came from the new heavy industries that had grown up on the outskirts of Paris. In the whole workers in the new large scale industries in the factories and suburbs of Paris had not yet formed their own ways of organisation and combat. It seems that the local leadership as it had developed felt too unsure of itself, too unsuited to play a more important role on a wider scale. This they left to militants from other more petty bourgeois districts. About 40 members had been involved in the French Labour movement and most of them had joined the international. Their experience in trade unions and workers association had made them suspicious of political power and this gave their thinking an anarchist tinge (more in the tradition of Proudhon rather than Mikhail Bakunin). About a dozen members of the commune were Blanquists. Their main hope was to save the revolution by getting Blanqui released, either by helping him escape in exchange for hostages... the Archbishop of Paris being the most notable. The Commune was installed on the 28th of March and on the 2nd of April Thiers troops began to attack. At first the Commune met in secret on the ground that it was a ’council of war’ however secrecy was not what was expected of a general assembly. The Central Committee of 20 districts, the International and some of the popular clubs all pressed the commune to make its sessions public. Following this pressure the Commune did agree to the publication of its debates in the daily Journal Officiel, and in principal agreed the public to its debates. However it proved difficult to find a large enough room and the problem was never really solved. Such theory that was ever formulated in 1871 was based on the ideas of 1793 of popular sovereignty : those elected to represent the people were to act as delegates, not as parliamentary members. The popular clubs in particular several times claimed that sovereignty lay as much with them as with the as with the Commune at the Hotel de Ville. Those elected by the people were subject to recall by the people and it was the duty of those elected to report back and remain in constant touch with the sources of popular sovereignty. Their was talk in some of the clubs of bringing pressure on the commune , and attempts were made towards grouping the forces of the clubs so as to be able better to do this. Some members of the Commune did try to keep in close touch with the forces that brought them to power frequenting the clubs. The actual social legislation passed by the commune seems reformist rather than revolutionary, taking up demands that had been formulated by the labour movement during the preceding 20 to thirty years. Rents owing for the period of the siege were cancelled but otherwise the rights of private property were not questioned. After much debate a three year delay was granted for the payment of outstanding bills. Taken together these measures shocked bourgeoisie opinion outside Paris. The Commune set up unemployment exchanges in the town halls and abolished night work for bakers in face of opposition from the employers. The most pressing social question facing the commune was that of unemployment and took the radical step of allowing trade unions and workers co-operatives to take over factories not in use in order to start up them up again. However more extreme suggestions that all the big factories of the monopolists should be taken over by the workers were rejected. By the 14 of May 43 produces co operatives had been formed among the many craft industries in the city. In the field of education the main effort was to provide basic elementary education for all. The reform movement was strongly against the church schools which amounted to just over half the schools in Paris. National guards were used to evict priests and nuns and replace them by republicans. Women’s education was given special attention having being the most neglected area. A special commission was formed with an all-female membership to oversee the attempts made to set up girls schools. Day nurseries to be situated near the factories were also proposed as a means to help working women. None of these schemes - of co-operative industrial organisation or of educational reform could come to much. There was too little time and the war had to be won. Theirs and his ministers at Versailles has no doubt that the Paris Commune was a declaration of social change that had to be crushed by civil war. This was a view shared by governments outside France, for the very existence of the Commune roused the fury of the European bourgeoisie. On the 29 March The London Times described the revolution as the predominance of the Proletariat over the wealthy classes, of the workman over the master, of Labour over Capital The Russian Emperor pressed the German government not to hinder the French repression of the Commune because the government at Versailles was a safeguard for both France an all Europe and Bismarck threatened to use the German army if Theirs did not hurry up. It is from the Right as much as from the Left that the socialist nature of the Commune can be and was seen. In many ways the most striking aspect of the Commune was the festive nature of Paris ; it was a ’festival of the oppressed’, . The atmosphere within the capital was not that of a city dominated by war, the city had ’all the signs of simply being on holiday’. Soon however the mood became grave. The funerals of National Guardsmen killed in the fighting became grand processions across the city, headed by members of the commune and anyone who refused to bear his head was forced to by the hisses of the crowd. Another moment of drama was provided when the Freemasons rallied to the Commune and marched with their banners, never seen before in public to the city walls, where they sent off a deputation to see Theirs (who refused to met them and they returned to Paris). Huge Public ceremonies were held such as the burning of a guillotine and the demolition of the Vendôme Column (a symbol of the empire) . The excitement was so intense an English observer wrote that people moved about as if in a dream Even on the very day that the Versailles forces broke into Paris-Sunday the 21 of May there were large crowds in the Tuileries gardens listening to one of a series of concerts given in aid of the wounded widows and orphans. The commune heavily fortified as it was and with a substantial military force at its disposal was able to hold our against Thiers and the army for two months however on the 21st of May the government troops entered Paris. There followed a werek of bitter and bloody street fighting all the more bitter because the Parisians could no longer hope to win. Few preparations had been made for the eventuality that the French troops would enter Paris and the much talked on second line of defence did not exist. Those in charge of erecting barricades had been too methodical and slow so very few barricades existed. Through the night and into Monday morning troops poured into Paris by 5 different gates. They quickly occupied two bourgeois districts in the south west of the city. From there a two pronged attack occurred one along the left bank of the Seine and the other on the Right bank. Haussmans boulevards were to show their value in enabling rapid movement of large numbers of men to outflank revolutionary districts and their barricades. By the morning of Monday May 22 the western third of Paris was in government hands after hardly any fighting and some 1,500 National Guards had surrendered. The commune assembled at 9.00, twenty members being found at the Hotel de Ville, a poster was drawn up calling citizens to arms on the Barricades. Barricades were quickly erected in the centre of Paris. On the rude de Rivoli 50 masons built in a few hours a barricade 18 feet high and several yards deep. Swarms of children brought up barrows of earth and the prostitutes from La Halle helped filled the sacks. Over 160 barricades were erected on the first day, over 600 in all. Most were only 5-6 feet high constructed of paving stones dug up from the streets with sometimes metal grills from the base of trees thrown at the foot, a cannon or a machinegun and a red flag wedged on top. The barricades in the rue de Beaubourg were made largely of mattresses from a nearby warehouse, thrown down into the street by women. Others were simply obstructions of overturned busses and cabs, sandbags bricks or anything else. Everybody who passed was forced to help. In the Place Blanche a battalion of 120 women erected the legendary barricade which they defended vigorously on the Tuesday many being massacred after it fell. Those Federals that had retreated in front of the French army dispersed back to their homes saying they preferred to die in their own quarters. The very strong criticisms Blanqui had made in 1868 of the June 1848 rising are also applicable to the barricades on the commune. The tactic of fighting for your own area with no central organisation made it easy for the army to group its forces and take the barricades one by one. Early Tuesday morning the Versailles troops moved through the neutral zone outside Paris, the Prussians turning a blind eye, and entered Paris through another gate capturing 2 more suburbs of Paris. The massacres that were to grow more fearsome as the werek advanced now began, 42 men, 3 women and 4 children were shot in front of a wall, a court martial was improvised in a house on rue de Rosiers and for the rest of the week batches of prisoners were taken there to be executed. On Tuesday night the Communards began to burn down any buildings that threatened the safety of the barricades by sheltering snipers. The whole of the rue de Rivoli was a sheet on flames, the Tuluise Palace and the Ministry of Finance were all on fire. Firemen had been sent to try and put it out but they were unsuccessful, and its huge red and black plumes from masses and masses of documents rose into the sky showering the city with a fine rain of charred paper. The wind carried fragments as far as Saint German ten miles away and crowds assembled to watch the spectacle of Paris burning. The barricade there was not finally taken until Wednesday morning, one of the last to fall being a women who sprang onto it waving a red flag defiantly at the troops. Some 30 defenders were taken prisoner and shot, their bodies thrown into the ditch in front of the barricade. At 8.00 on Wednesday it was decided to abandon the Hotel de Ville and it was set on fire to cover the retreat. Paris in flames was and still often is the most common picture presented of the Commune, the list of buildings destroyed is enormous, some buildings, understandably, like the Prefecture of Police and the Palace of Justice being fired by the Commune, some by the Versailles shells. Rumours were spread, almost definitely unfounded or the petroleuses, women incendiaries who went around setting fire to basements, on the bases of the rumour many innocent women were shot. However many of the communards knew this was to be their last stand and were pleased to take Paris with them. On the Wednesday a National Guard officer tried to persuade his men to join him in the Arsenal munitions depot to blow it (and them) up, assuring them we will all go up together mes enfants. Meanwhile in Paris a more indiscriminate slaughter was taking place, each time a barricade fell, the defenders were put up against a wall and shot ; 300 were shot after they fled for sanctuary into the Madelaine church. The seminary adjoining Saint-Sulpice had been turned into a hospital, Versailles troops arrived and proceeded to shoot all the medical staff and their patients leaving behind 80 corpses, they same occurred in Beaujon hospital. The battle for the Latin Quarter lasted 2 days, the Tuesday and the Wednesday. Throughout Thursday and Friday the Communards were pushed back, gradually loosing control of the city. Saturday morning dawned foggy and raining for the second day running. some of the last fighting on this day took place in the Pere-Lachaise cemetery where about 200 National Guards had foolishly failed to put into a proper state of defence. The army blew open the gate and there was biter hand to hand fighting around the tombs in the heavy rain and falling light. Those not killed in the fighting were lined up against a wall in the eastern corner of the cemetery and shot, the killings continued there for several days. The very last barricade held out for a quarter of an hour defended by a single man. He fired his last shot and walked away and so by Sunday the 28th of May the Commune had completely collapsed. If the battle was over the shooting was not. The Versailles victory quickly became a blood bath, anybody in any way connected to the commune or just in the wrong place at the wrong time was shot. Anybody who was in Paris was thereby suspect, guilty even. This reaction of the officers shows the shift to the right that had occurred within the French army. Far more died during that last week in May than in any of the battles of the Franco Prussian war, than on any of the previous massacres in French History. The terror of the French revolution amounted to about 19,000 deaths in a year and a half. There is no exact figure but something in the region of 30,000 Parisians were killed during the commune compared to the Versailles losses of 900 dead and 6,500 wounded. About 50,000 were arrested, among them Louise Michel. At her trial she demanded to be shot saying Since it seems as if every heart that beats for liberty has only the right to a little lead, I too demand by share . Instead she was deported to New Caledonia, a French colony of the coast of Australia along with 4,500 others. Many died in prison or on the transports. Those who escaped went onto exile in Switzerland, Belgium, Britain or further afield. Two in fact ended up marrying two of Marx’s daughters in Britain. As Marx wrote to Engels Longuet is the last Proudhonist, Lafargue is the last Bakuinist. The devil take the two of them . Nine years later a general amnesty was voted. This was as a result a republican and ’socialist’ electoral victories , culminating in the election of a shoe-maker, ex member of the Paris Commune as a socialist Deputy for Belleville. Just previously 25,000 people had responded to the appeal of the socialists, and in spite of police attacks had held the first commemorative demonstration at the Wall of Père-Lachaise. The immediate consequences of the defeat of the Commune were disastrous for the French Labour moment as a period of severe repression followed the blood letting of the last week. Paris remained under martial law for 5 years and the International was outlawed. Armed with new political powers, the police were active in rounding up political activists who were given heavy sentences. The International was practically forced out of existence. The leading activists of the working class were either dead, imprisoned or in exile.